The magazine is organized into four sections that reflect the app’s different modes: “You First,” “You + BFFs,” “You + Dating” and “You + Bizz.” Each issue will feature advice from experts, celebrity interviews, in-depth features, trend pieces on hot topics, answers to burning questions posed by users, product guides and more. Contributors to the debut issue include tennis icon and Bumble global advisor Serena Williams, actresses and Bumble creative directors Erin and Sara Foster, and inspiring entrepreneurs like Man Repeller founder Leandra Medine, jewelry designer Jennifer Meyer and Away luggage co-founder Jen Rubio. 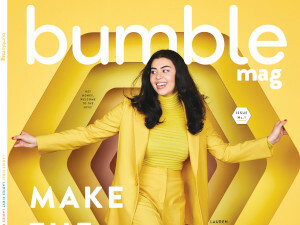 The first issue of Bumble Mag is available for free while supplies last. To request a copy, open the app and match with the magazine’s profile. For more on this dating service, check out our review of Bumble.